Admire stunning views from the very top of the steps at the Baleines, Chassiron, Coubre and Cordouan lighthouses. This will definitely be one of your best holiday memories! For a unique, magical experience, visit the lighthouses of Charente-Maritime and reach for the sky while admiring some breath-taking views. Enjoy incomparable light, the pure air, the salty smell of the sea, the wind and the sound of the waves sharpening all of your senses. Shine a spotlight on these sentinels of the sea, which were vital navigation aids for sailors. In Saint-Clément-des-Baleines, Baleines Lighthouse shines a light on Pointe de Ré la Blanche from a height of 57 metres. 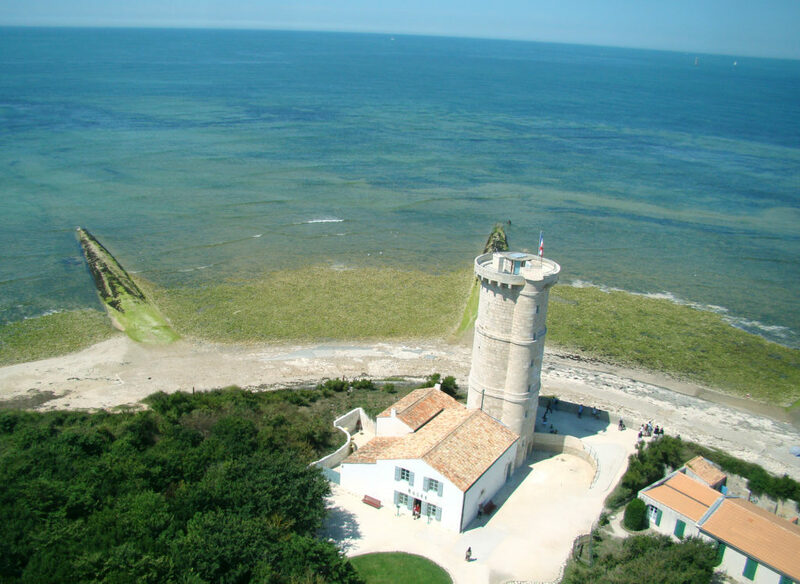 At the top of its dizzying 257-step staircase, enjoy a spectacular view that stretches to the Bay of Aiguillon and Vendée. Don’t miss the exhibition designed with the help of Jamy, a famous presenter from the TV show C’est pas sorcier, and find out all about lighthouses and beacons. At the heart of the forest of the same name, the Coubre Lighthouse nestles in an oasis of green. This blanket of pine and oak trees covers the western side of the Arvert peninsula. Here, no fewer than 300 steps up a vertiginous staircase decorated with blue opaline glass await brave visitors. The view of the endless forest and sands is a fitting reward for the 64m climb. On one side you’ll see the beaches, on the other, the wild coast stretching up to the surfer paradise of Pointe Espagnole. Set a course for the end of the world. The famous Chassiron Lighthouse, decked in its black and white stripes, watches over Oléron. A soaring spectacle awaits you after your 224-step, 43m climb. There’s a superb view of the island’s east coast and beyond. While you’re there, take a look at Fort Boyard, the Antioche straits and the islands of Ré, Aix and Madame. The gardens of the Chassiron Lighthouse are well worth visiting too! On a rocky islet in the middle of the mouth of the Gironde River, the Cordouan Lighthouselooks out over Europe’s biggest estuary. A gem of the Atlantic coast, the Cordouan is a 68m technical feat and dates from the 14th century. It’s the oldest functioning lighthouse and the last to house its keepers year-round. Getting there is an adventure in itself, but climb its six floors and you’ll be met with a breath-taking view. Set sail from Royan with Croisière la Sirène, Royan Croisières or Cordouan Express, or from Meschers with Meschers Croisières.